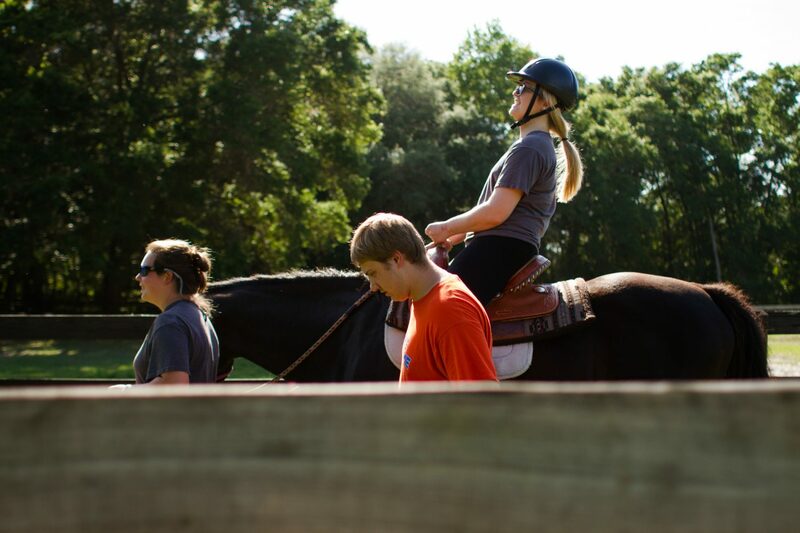 For a former horseback riding champion, mounting a horse may not seem like much of an accomplishment, but Lauren Ault has come a long way. Seven years ago, Ault was diagnosed with a brain stem tumor, forcing her to rely on a wheelchair. 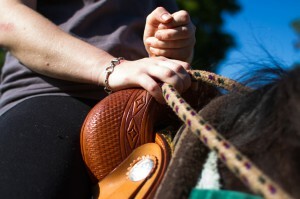 Lauren, 27, began riding horses at the age of 3 in Charles City, Va. Her father, Peter, was an avid fox hunter and wanted his daughters to like horses as much as he did. After her parents divorced in 1990, Lauren moved to Gainesville with her mother. She took horseback-riding lessons and made frequent trips to Virginia to compete in English riding competitions and to hunt with her father. In middle school, Lauren began having daily headaches. Her mother took her to a pediatrician frequently but was told she was merely suffering tension headaches due to stress. Ellen said this went on for eight years. After graduating from Gainesville High School, Lauren began taking classes at Santa Fe College. For the first time in her life, she had trouble focusing and had to receive tutoring. After a year, she decided she had enough with school and moved to New York to pursue modeling and theater. However, her headaches did not improve, and she returned to Gainesville a year later. Upon her return, Ellen noticed a change in her daughter’s appearance. 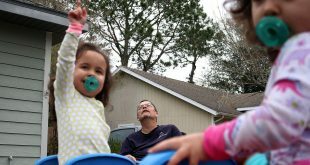 She was taken to UF Health Shands Hospital where MRI and CT scans showed her brain had opened and had started to shift down her spine. She had emergency surgery that night. Following the surgery, Lauren’s behavior began to change. Despite expressing her concern, Ellen said the doctors assured her everything was normal. Lauren has no vision in her left eye and is 80 percent blind in the right. She also has no sense of taste and described her sense of smell as off. Following the surgery, Lauren did not respond well to her physical therapy, which she described as monotonous. But after her elementary school teacher recommended her mother look into HOPE, things began to improve. 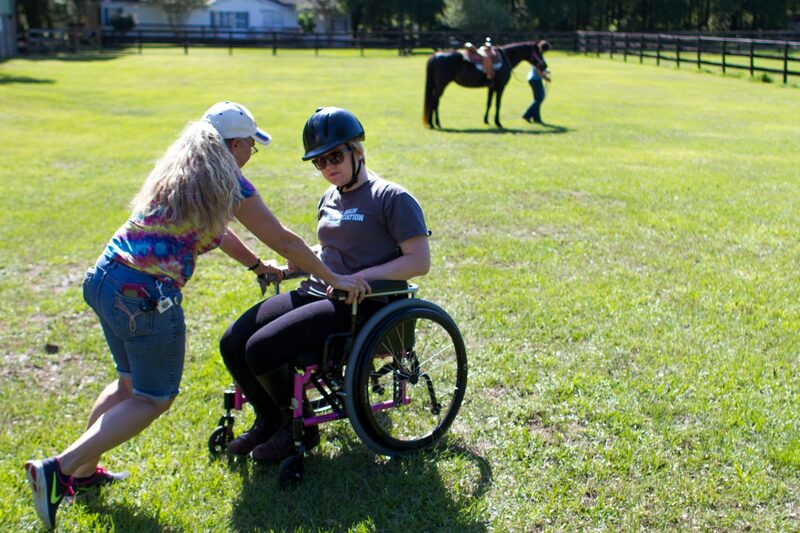 Lauren’s mother said she has noticed a huge improvement since Lauren first began the horse-aided therapy. Beyond the physical benefits, hippothearpy provides Lauren a much-needed escape from the restrictions of her wheelchair. Although she has made great strides in her therapy, Lauren is not content. She wants to ride on her own again. Lauren hopes to gain that independence with a custom saddle that will provide her with better input, which mimics a walking pattern in a patient’s pelvis through the horse’s movements, and limit her forward and backward movement. “The saddle will help her focus on riding rather than just staying on the horse,” said Brown, who is also Lauren’s occupational therapist. Carol Dougherty, who handles fundraising for HOPE, first met Lauren at the farm a year ago. 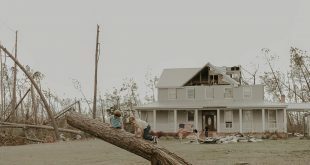 Dougherty, whose brother donated the use of the 40 acres HOPE operates on, immediately found a connection with her. 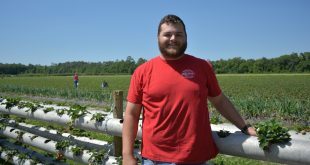 “We’re both overcomers,” said Dougherty, who suffered a MRSA infection in the spine. 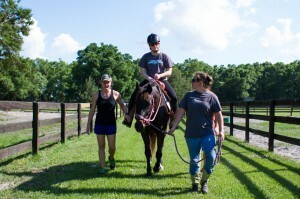 Dougherty saw how much horse riding meant for Lauren and began talking to CYMplify, a local coffee company, about holding an event that would raise money for Lauren’s saddle. The benefit will be held at Gainesville’s CYM Coffee Co., located at 5402 NW 8th Ave., on Friday. The event will feature music, face painting, food and a beer garden. Cyanne is a reporter for WUFT News and can be contacted by calling 352-392-6397 or emailing news@wuft.org.